I have seen pumps plugged, systems full of mud, and boilers failing. Yup, most of us have had the problem. Feel free to search it here on the site, or on google. I posted a few years back. Flush. add cleaner for a week the flush and add inhibitor. I have used Rhomar. Fernox is also very good. Has watts addressed the situation. 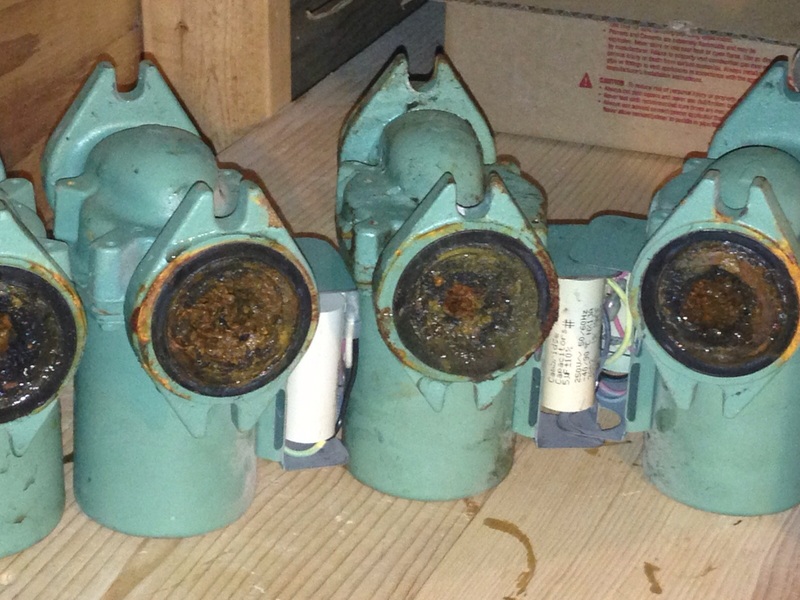 I have seen at least 6 systems with this problem and changed at least 8 water tube boilers. Are there leaks in the system, allowing too much fresh water to be added constantly to the system? A completely tight system should not have that sort of buildup. Its the tubing... I have seen it time and time again. I believe Watts is in denial. All flex tubing lets in some sort of O2. Pex, Pert, polybute or EPDM rubber. The higher the water temps the more the O2 ingress. Since the Onyx uses no plates they run higher water temps....more diffusion. Shows to go you that water treatment is very important. I service another system out there that has Poly B for the heat distribution...Runtal rads. they have lost 5 of those rads since 1987. Flush, clean, and fill with an inhibitor package as suggested above. As they fail, replace components with non-ferrous equivalents. Don't forget the expansion tank -- look at the Amtrol RX series. You can use a potable water expansion tank, but watch out for nonstandard fitting sizes there. I understand if you tell me ,"None of your F'in business". I'm familiar with this tubing, how do you purpose the oxygen gets past the aluminum ? With PAP one of the talking points was how the aluminum layer was applied. Some brands use just a lap seam, others a welded seam. Some say the glued lap seam was a concern for 100% barrier from O2 ingress. I'm not sure how the aluminum layer os added to Onix? A least one big name brand of PAP is gone from the market due to problems with the aluminum layer. in some cases the alleged corrosion of the aluminum was due to the brass fittings reacting with the aluminum on the ends. Corrosion from dissimilar metals would react with the aluminum layer and it could corrode away from both ends. Checking the integrity of that aluminum layer is not easily done. I think Watts blasts a steel ball through the Onix to assure the ID has extruded correctly, as the extruding machine always adjusts as it runs. I don't know of a means to check the entire length of the aluminum barrier. I imagine if you could crawl inside, like Ms. Frizzle, you would find a wavy inner dimension. It seems like just certain batches have potential O2 ingress issues and there are a fair number of slugged systems out there. Check with the Colorado hydronic guys. Same with Entran 2 and TwinTran, not all systems failed or sludged, many are still running with some maintenance to the fluid. If you have a slugged system, and the flushed sludge stick to a magnet, you have O2 getting into the system on an ongoing basis, from what I have learned. Either the barrier is compromised, or the ends allow enough O2 in? If you chose the chemical protection route, you will need to check and possibly add O2 inhibitors if O2 is getting in, the scavenger component of the hydronic conditioner will be consumed.